I was probably six or seven. I don’t remember exactly when it was. I just remember the trees feeling huge, the light dancing off the water blinding me a for a few seconds, while I tried to refocus on my sisters quietly making their way up the side of the stream. My dad loved to fish. He was patient with us the most during those precious camping trips. He taught me how to walk “like an indian”..heel, toe, heel, toe…slowly and quietly. He showed me how to pick the deep water holes where the fish hung out, or how to watch for where the water broke over rocks in the stream, and the niches near there where you would find them. I still can’t even put into words how to find a good spot on a stream to fish, but I can picture it in my mind, and feel it when I conjure that memory. I think I’ve probably been fishing a couple times in my adult life, and I still remember those times with my family growing up, the taste of fresh trout cooked on the open fire. No fish, ever, tastes as good as a fish your seven year old self reeled in, cleaned by her indulgent father, and cooked up on a hot fire of wood. But, if I had to pick a “second-best” fish, it’s this recipe. The first few times I cooked fish, it felt daunting. If you’re scared of cooking fish, now’s the time to try. There are three ways to know if it’s cooked right, and I’ll walk you through it. You’ll probably over cook it the first few times, and then you’ll get the feel for it. This recipe is super easy and tasty. When each of my kids were ready for “regular” food that wasn’t pulverized into a mushy pulp, I would make this once a week. 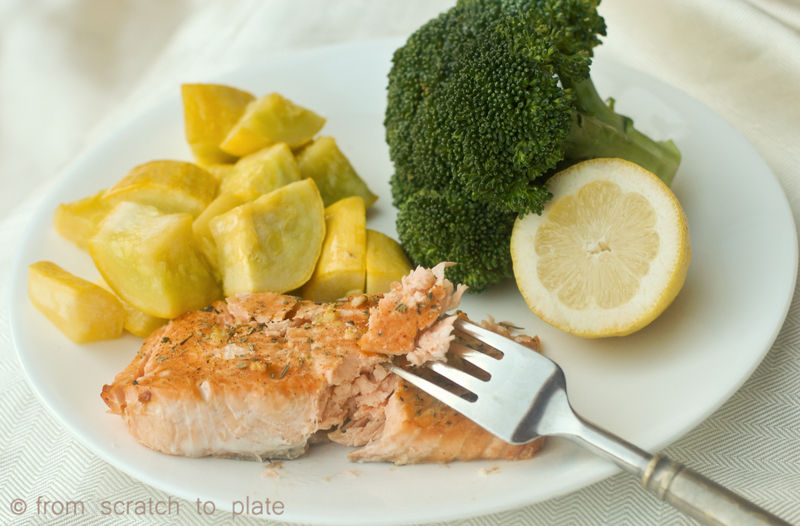 The fish is easy to chew for little ones and super healthy, with lots of brain-building omega fatty acids. My kids still love this dish. I actually don’t use the measurements here, I just squeeze a lemon over it, sprinkle with seasoned salt and Italian seasoning, and press a clove of garlic or two and spread that over best I can. But, if you’re a measuring type person, there are measurements for you. They may vary, based on how much fish you are cooking. You can use this same recipe for any type of fish, and any size, whether it’s filets or portions. 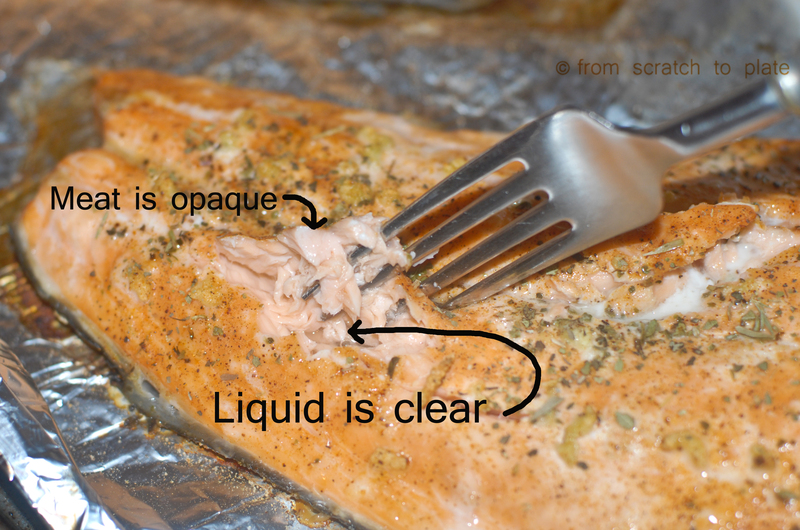 To determine if the fish is cooked, use a fork and “flake” in the thickest part of the fillet, by putting the fork in and turning it. You want fish that will 1.Flake easily, 2. Has clear liquid, 3. Is opaque. I think the “flake easily” part can be misleading for a person new to cooking fish. Salmon is a soft fish, and “easily” is a loose term. You want the flesh to be fairly firm. Appearance will help you a ton. The flesh should be opaque, meaning it doesn’t look at all like light could shine through it. Also, check out the liquid in the fish. It should not be milky, but should be fairly clear. I like buying the salmon that has the skin on one side. It keeps the fish from sticking, keeps the bottom from drying out when you cook it, and it easily removes from the skin after being cooked, by putting a spatula between the skin and the cooked fish to lift the fish to the dish. 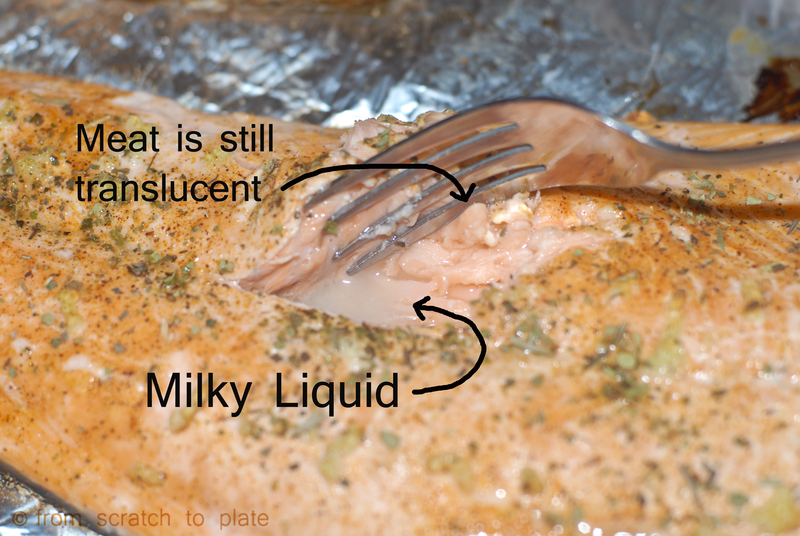 A few comments on salmon: be aware that farm raised salmon has artificial color added. Go to your store’s fresh fish section and compare the wild caught with the farm raised salmon, the color difference is striking. Wild caught salmon is a robust color. It is also much lower in fat and cholesterol than farm raised. 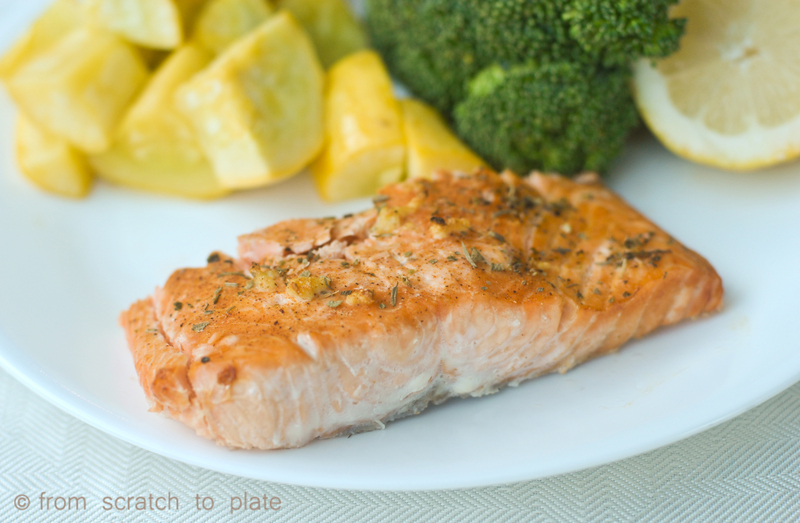 Wild salmon is typically higher in both protein and usable omega fatty acids. In my pictures, I included a picture of the underside of the fish, which has a grey layer. That part seems to creep out new fish cooks… and kids. It is the fat that connects the skin to the flesh. If you are super conscientious about your fat intake, you can scrape it right off. But, I would point out that it is a good kind of fat, with lots of omegas. I always keep it on, especially for my kids. Preheat oven to 450 degrees. 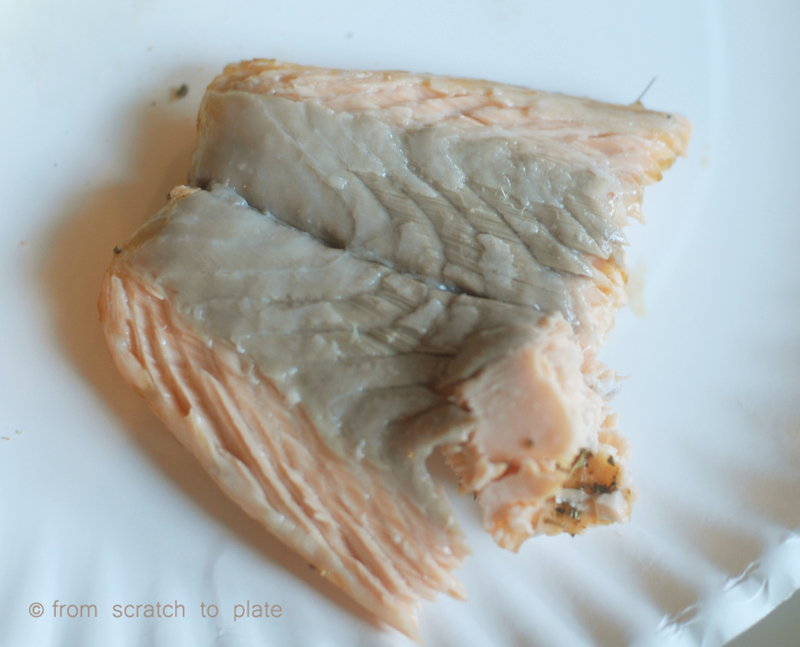 Place salmon, skin side down, on a foil- or parchment-covered baking sheet. 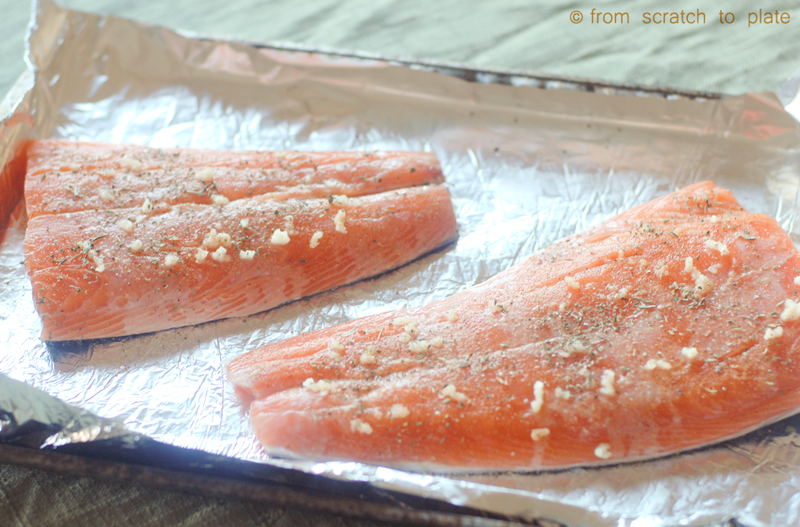 If your fish does not have skin, lightly grease the foil to keep it from sticking. Drizzle the lemon juice on top, followed by the garlic, then the seasonings. Bake 10-20 minutes, until it it opaque and the juice runs clear. REAL food alert: check your seasoned salt for MSG, additives and preservatives. To avoid artificial color, only buy wild caught salmon. If using frozen fish, check ingredients for preservatives, including TBHQ. Always buy fresh when you can. The gray stuff is healthy fat, perfectly edible and yummy.